A little late, I know! We were lucky enough to have 2 Christmases. The first one was the weekend before Christmas. We went back to the UK on a flying visit to my parents. It was our first opportunity to see the new house they have had built. They knocked down the bungalow I grew up in way back in April 2011 and started work on a new 5 bed house. They have sent us regular photos but we did not go and visit during the build as Mum and Dad lived on site in a caravan. So driving up and seeing this huge house was a bit of a shock! The house is beautiful. Katharine and co moved in early December and it is nearly all complete. The next time we go back I'm sure it will look different again. 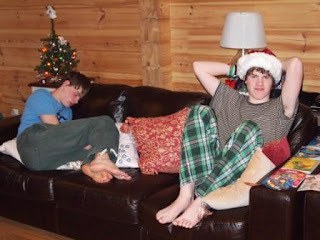 I've included a photo of us on arrival night by the Christmas tree. 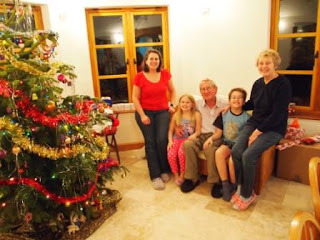 We spent the weekend with the family, having Christmas dinner and a brunch the next day. We got to meet Tiami, a new cousin and to also catch up with our other cousins too, plus Annette and Joe. It was great to see everyone and, of course see the house. Also did a little shopping! We got back here on the Sunday, so it was a quick trip back. 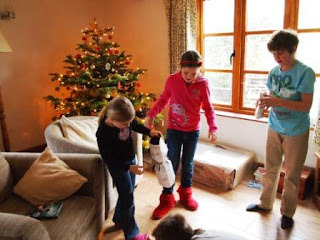 We then had to get ready for Christmas for real down in France with Grandma Melrose and the Turners. We drove down on the Thursday, stopping on the German Swiss border. We stayed in a lovely hotel with an excellent restaurant. 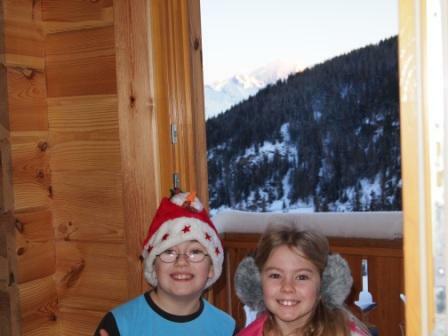 We arrived at our appartment, just outside La Plagne 1800, Friday afternoon. It was a 3 story wooden house, very modern with a great view. Our Scotish family were out so it gave us time to get unpacked and go and rent skis for the kids. We had a wonderful week, Jacob and Abi loved having Finn and Cameron around 24 7. 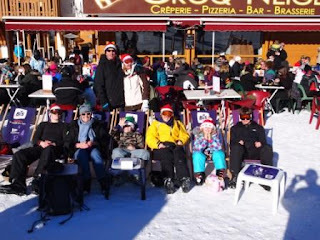 We enjoyed good food, skiing and great company. Abi really got into rummy, the card game, and has continued playing it back here! We generally had blue skies and excellent snow. I still prefer skiing in America but it was excellent being with the family, just need to all go to America next time! The food was very good, I'll do another post of Allen's birthday - we went out for a meal. So both Christmases were good fun.